Bracknell, located in the heart of the Royal County of Berkshire, has one of the county’s most affluent catchment populations, ranked 14th in the UK by this measure (Promis). 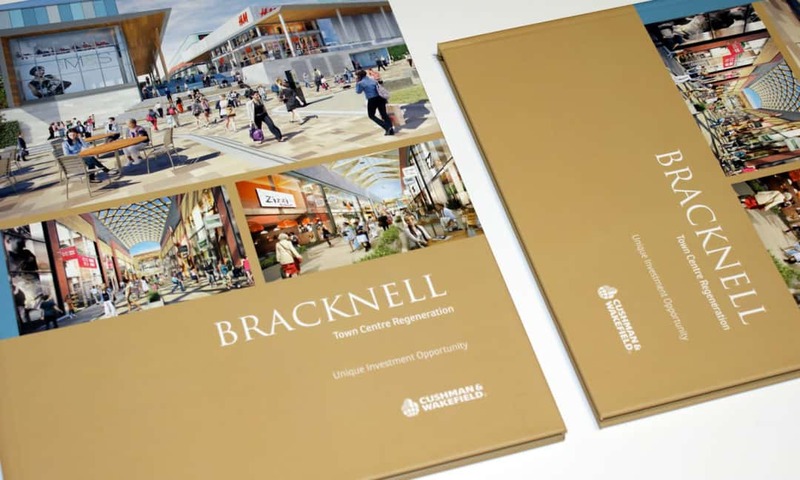 The new development will be undertaken by Bracknell Regeneration Partnership (BRP), which was established in 2003 as a 50/50 JV vehicle between Legal & General and Schroders. The objective is to deliver a comprehensive mixed-use regeneration of the town centre, designed to create a vibrant destination of choice for the people of Bracknell. Our design team was invited by Cushman & Wakefield to create a specialist property marketing package for the new development as they sought to build a tailor-made strategy ready to go to the market. When instructed on a job of this scale, it’s important to first identify what is required and to act on it swiftly, something our team are more than capable of doing. It was decided that the scheme would benefit from the design of an oversized A4 brochure, so that’s what we did. The bespoke brochure was filled with exciting new aerial and location CGI’s of the investment, custom maps and charts, a detailed in-depth analysis of the scheme’s potential financial standings, along with information about the area’s unique heritage.